I succeeded the post of director of the International Student Center at Gifu University from Professor Hiroshi Moritomi in April 2014. The International Student Center was established in May 1996 as a designated campus-wide educational research facility of the Ministry of Education (the Present Ministry of Education, Culture, Sports, Science and Technology). Eighteen years has passed since its establishment. 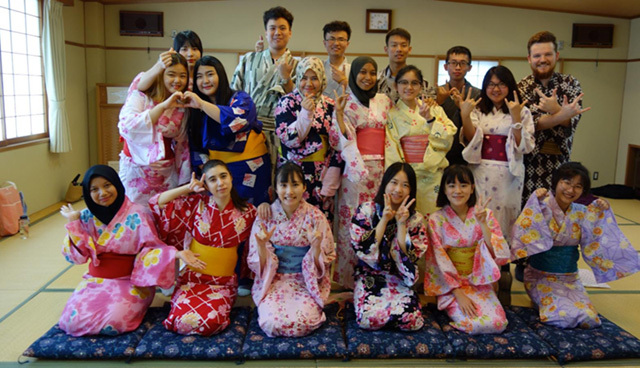 The main objectives of the Center are to offer Japanese language and studies courses for international students, offer education on cross-cultural understanding, provide international students with guidance and counseling in their studies and daily life, provide Japanese students with guidance and preparatory courses including language training prior to their studies overseas, contribute to active exchanges between Japanese and international students, and conduct research into these areas. Another important task of the Center is to share the accomplishments of its education and research with society. We therefore offer public seminars and forums. The Center has been engaged in these various activities since its establishment. In 2009, the number of students who were studying outside their own countries stood at about 3,700,000 worldwide, tripled in the past 20 years. The number of international students who study in Japan has doubled to 140,000 in the past 10 years. However, the number of Japanese students who were studying overseas was its peak in 2004 and dropped to 60,000 in 2009. In response to the globalization of Japanese companies and their demand for a global workforce, the Japanese government came up with a measure to double the enrollment of students studying abroad, with the aim of receiving 300,000 international students at Japanese universities and dispatching 120,000 Japanese students to universities outside Japan. With the government’s initiative, more students are expected to study overseas in the future. At Gifu University, approximately 300 international students are currently enrolled. Taking this situation into account, we consider that international cultural exchange and student exchange are the key projects of Gifu University that would appeal to the world. We will continue to promote international exchange with hand-in-hand coordination with local communities. This will be realized by providing educational courses on Japanese language and culture to international students, research students and researchers, by exchanging students and school personnel with affiliate universities overseas, and by providing Japanese students with educational courses on Japanese culture prior to their studies abroad. We would also like to seek your continued support and cooperation.